4.1 out of 5 based on 189 bloggers and 21 commenters. 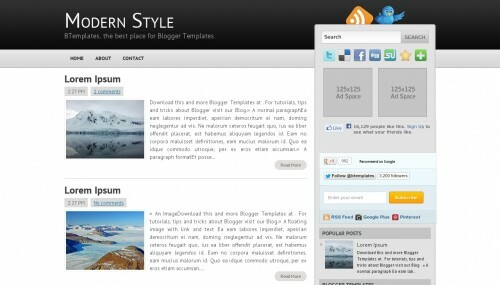 Modern Style is a free blogger template adapted from WordPress with 2 columns, right sidebar, ads ready, social bookmarking icons and posts thumbnails. Excellent template for blogs about any general topic or to write a diary. How to increase the width of sidebar? nice and perfect theme for simple and professional look.. Thanks for this awesome template. Hi, Can I know if I need at least 5 widget bars for ads on the right hand side, ( two in 125 x 125 and three in 200x 200 ) isit possible ? And also can the top header banner and whole colour theme be changed ? Example in blue and white theme ? Also can we have our own built in opt in form on the right hand side ? And below every post, can the social media sharing buttons be made bigger ? Sorry, not very familiar with this, please kindly assist. Thank you ! Why my index is error? I just love the modern template, but how can I remove the Adds spaces? this is a best tamplant,. Thanks for sheare a great theme. how to add date information to every post in this template?